After graduating High School, Rusty continued studying Music Theory at the local college, as well as Music History and Class Piano. In 1989, Rusty joined the local rock band Revolution. Revolution wrote, performed and recorded all original music. They became one of Houston’s top drawing bands. Revolution opened for national acts like Badlands, Nitro, Every Mothers Nightmare, and South Gang. In 1992, Revolution released a four-song EP. Revolution’s music was once described as Skid Row meets Yngwie Malmsteen. Revolution made two appearances on a local TV show called “Metallurgy” and “Metallurgy Unplugged”. Rusty also taught guitar on a college TV show called “Stay Tuned”. In 1993, Rusty quit the band due to musical differences and started a new band Dominion. Dominion wrote and performed locally as well but was short lived and broke up in 1995. 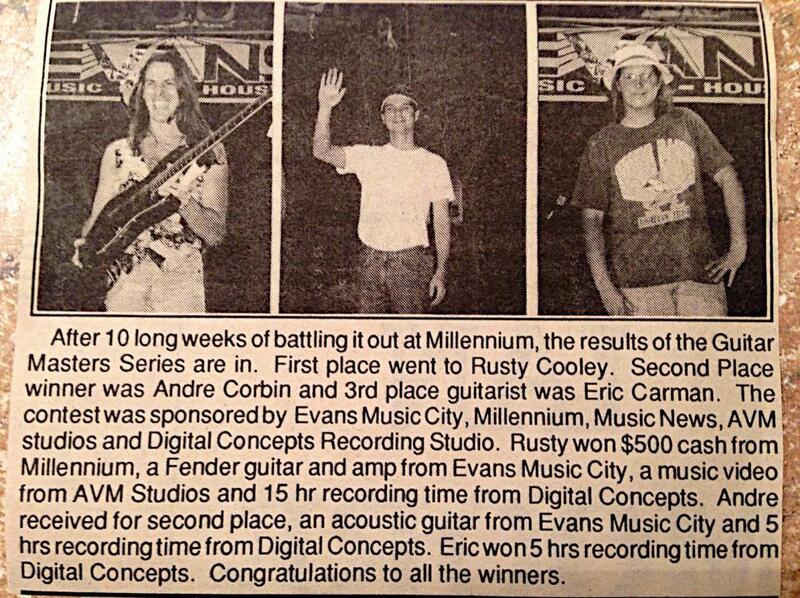 Also, during 1995 Rusty entered and won the “Guitar Master Series” winning the title of “Best Guitarist” in Houston. 1996 marked the beginning of a new direction. Rusty bought his first 7-string guitar and decided it was time to go for it on his own. Rusty went back to the woodshed and started working on his guitar playing intensely pushing himself to new levels. Along with this came a whole new list of influences that fueled the fire….Shawn Lane, Derek Taylor, Buckethead, Todd Duane, Scott Stine and Haji’s Kitchen. It was during this period that Rusty began to work on instrumental guitar compositions. These songs represented his desire to record an over-the-top guitar instrumental release featuring state of the art chops and strong melodic content. Rusty was also selected as a runner up in the AIM “Jason Becker Scholarship Search.” Rusty hosted three episodes of a local cable show called “World Class Guitar Techniques,” which aired in the Houston area. Rusty taught for the National Guitar Summer Workshop in 96, 97, 98 at the Austin and Connecticut Campuses. In October 1997, the band Outworld was formed to record and perform instrumental music. In March 1998, Rusty was invited to join Shrapnel recording artists Haji’s Kitchen, but had to decline due to relocation problems. In 2000, Rusty released an instructional cd rom “Shred Guitar Manifesto” and gained endorsements with Jackson Guitars and Seymour Duncan pickups. Rusty also started doing guitar clinics as well. Rusty’s presence on the Internet was growing and his music started getting great reviews, which followed with interviews and instructional columns. His music was featured on several compellation cd’s as well. Outworld performed at the internationally acclaimed “Bang Your Head Festival” in Houston, and was featured on Robb’s Metal works a San Antonio, Texas Heavy Metal TV show. In August 2001, Rusty left Outworld and Houston to move to Alpharetta Georgia. After a short time in Georgia, two more instructional cd roms “Extreme Pentatonics” and “The Art of Picking” where released. Soon after, Rusty was asked to headline Jemfest in Orlando, Florida in 2002. Additional endorsements followed: EMG pickups, VHT Amps and Digital Music Co. In late 2002 the instrumental CD was finished and Rusty began looking for a record label. He also had a custom 8 string guitar hand made by Bill Conklin of Conklin guitars. In 2003 some exciting events occurred and soon Rusty signed with Lion Music and the debut CD was released in January. In April, Rusty was given the honor of the “7th Fastest Shredder of all Time” in Guitar One Magazine. In May, Rusty moved back to Texas. Not wanting to be known for shred skills alone, he and Bobby Williamson reformed Outworld as a vocal band. While undergoing a number of personnel changes, Outworld recorded its self-titled debut CD which was released in late 2006 to both critical and artist acclaim. 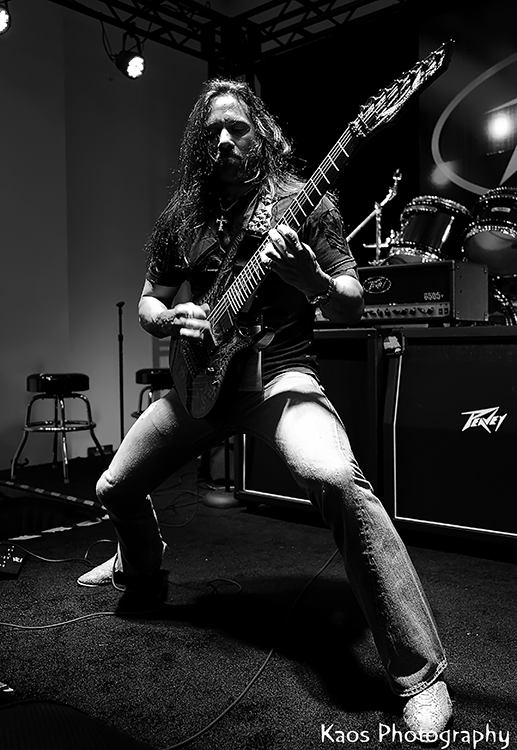 With the success of Outworld’s debut CD, and increasing notoriety in guitar circles, Rusty garnered a significant number of endorsements with Dean Guitars, EMG pickups, Diamond Amplification, Morley, Intellitouch, Rocktron, Maxon, GHS strings, VHT, Conklin, and Eventide. And 2007 saw the development and release of his Dean Signature Guitar, the RC7 Xenocide. Rusty has also been featured in Guitar Player, Guitar One, Guitar World, Guitar Techniques magazines, Axe and written his own column for Guitar Player magazine titled “Metal Guru”. With a stable and impressive band lineup, Rusty is currently writing and recording Outworld’s second CD which promises to capitalize on the strengths of the debut CD and demolish all expectations. In August 2007 Outworld won 10,000 in a Famecast contest similar to American Idol where viewers watched and voted for the favorite artist.